Mike received a Bachelor’s Degree in Science from Howard Payne University and a Master’s Degree in Criminal Justice from Tarleton State University. He began his career with the Texas Youth Commission as an entry level Youth Activity Supervisor and through dedication and hard work, continued to move into various position up to an Assistant Superintendent, Superintendent and Regional Director over six Texas Youth Commission facilities and four half-way houses. 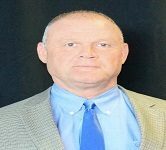 In 2011, he became the Assistant Director of Programs with the Mexia State Supported Living Center and in 2012, became the Director where he served until April 2016. He also served as Deputy Sheriff for Comal County in the mid 1990’s. © 2019 Nueces Center for Mental Health and Intellectual Disabilities.